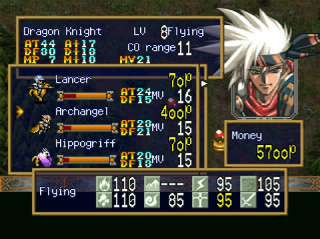 Translations: Langrisser IV (Playstation) English Translation Released! Okay, to a few of you this may not be "news" as it has been around for about nine months, but I just found it and it wasn't listed here on Romhacking so I figured I would get the word out. 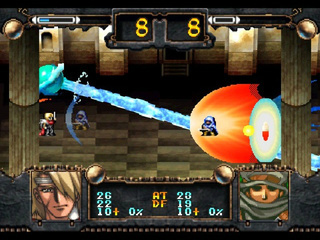 The Playstation official remake of Langrisser IV has been fully translated into English by Kil over at El Sallia! Check it out and have fun watching many nameless troops clash under the command of your heroes and feel accomplished when your heroes advance to the next class. Two stones, two crosses. The rest is just icing. Re: Translations: Langrisser IV (Playstation) English Translation Releasted! Where can we download this patch? There is no mention made of this in the description. Then google for the username and password to download it. If its alright with the creators of the translation I could easily make a patch for it along with a batch file patcher (think the Policenauts patcher) for romhacking.net. Unless there's some technical reason for why there isn't a patch already. Now we just need some love for langrisser tribute for Sega Saturn which includes all 5 games. Well I made an Xdelta patch of it and it seems to work fine and the MD5 matches up with the pre-patched one on elsallia.com. I have no idea why they didn't make this to begin with. Is it alright to upload this to the RHDN Project Page? "I can't make a patch because the majority of ISOs floating around are for a certain bad rip, which is different from the base I used. I could give out the 3 files on the CD that were changed which are worth less than 30 megabytes, but most people wouldn't know how to insert them." If the patch works for you that is great. I'm skeptical it will for most people, but if it does, that's fine. I have no problems with this either. As long as it works for people, all the better. Re: Translations: Langrisser IV (Playstation) English Translation Released! Okay, I just submitted it. I made a patcher for it and I used the Japanese BIN on your website as the base for the patch. It should work if you made a rip from the legit disk or used the Japanese BIN on your website. Patches which require rarer forms of a game are not uncommon. I've seen a fair share of patches for particular versions of games for example, as in numerical revisions of cartridge based games. Anyway, it is great to see a patch available for those who wish to acquire the end result in a more legal fashion. Granted, if someone already owned a physical copy of the Japanese game, it wouldn't be incredibly illegal to download a copy of it again. I guess. Who knows? The legality of patching and hacking is not something I want to get into again. Anyway, thanks to everyone who made this possible! And for the patch. Now this is really awesome news. And to think I was playing Der Langrisser a few days back, haha. I'm really glad you posted this, even if it's 9 months too late. I never would've known about it, romhacking.net is the only source for translation news I read. As a strategy rpg and Urushihara fan I'm totally in love with the Langrisser games. Great work, Kil! My thoughts exactly. Thanks a lot for posting! My suggestion is to lurk on CoES if you're a Langrisser fan. Nothing will happen for months at a time, but boy, when something does happen, it really happens as you can see. I just tried it myself using an image that I pulled from emuparadise (which has a smaller filesize than the image on El Sallia) and your patcher mentioned one mismatch, but still worked as far as I can tell. I was able to read everything fine into the first battle and also when I loaded my current save it all looked fine as well. Well done! By the way, does it give any info on what/where/which address the mismatch is at? The bad rip floating around always failed to play the audio on the overworld for me, that's all. your patcher mentioned one mismatch, but still worked as far as I can tell. I was able to read everything fine into the first battle and also when I loaded my current save it all looked fine as well. Well done! The bad rip floating around always failed to play the audio on the overworld for me, that's all. Is the over world music Redbook? If so then are you sure it's not your cue? That's what I thought, but it still wouldn't play after I fixed it (cue tested to work on the other rip). pSX constantly reported seek failures, and the ISO was strangely quite a bit smaller than it should have been. Also, cdmage had a lot of trouble doing things to it.